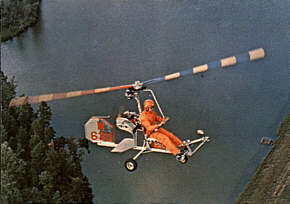 The gyroplane (or "gyrocopter" or simply "gyro") is essentially a helicopter-airplane hybrid, offering many of the benefits of both and several of its own. Many consider it among the safest aircraft you can fly. Unlike a helicopter, the gyro's rotor blades are unpowered, necessitating a short roll for take-off�unless the craft is fitted with a pre-rotator, which can greatly reduce or even eliminate the need for a runway. 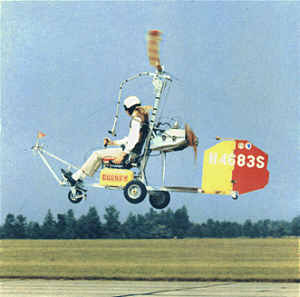 A major safety feature of the gyro is that if the engine fails, the craft can be easily glided to a safe landing. Also, the gyro is less affected by high wind than typical fixed-wing aircraft and is not subject to stall.